Along with its Baltic neighbors Estonia and Lithuania, Latvia received its independence from the Soviet Union in 1991. Since then, the country's main migration issue has been the status of its 1.1 million Russian-speaking residents, the legacy of the Soviet Union's Russification policy in which millions of people were removed from their homelands and sent to other parts of the territory. Ethnic Russians make up nearly 30 percent of the country's population of 2.4 million according to Latvia's 2000 census, while only 1.4 million are ethnic Latvians; the rest are Poles, Ukrainians, and Belarusians. Due to demographic trends, ethnic Latvians' share of the population has been decreasing, another cause for government concern. In May 2004, Latvia became one of the European Union's (EU) 10 new Member States. Approximately 30,000 people, mostly from the poorer, eastern parts of the country, have already chosen to live and work in Ireland, the UK, and Sweden — the only old Member States that did not impose restrictions on new EU nationals — and the trend is steady. As a result of Latvia's location at the crossroads of various powers, for most of its history it has been subject to foreign rule. At various times, Poland, Lithuania, Sweden, Germany, and Russia have governed the area and peoples of present-day Latvia. By the end of the 18th century, Latvia and the rest of the Baltic region were fully under Russian control. The capital, Riga, had become an important port with railway links to other parts of Russian Empire. It was during the 19th century that the various peoples living on Latvian territory began to develop a sense of common national identity. During the chaos of the Bolshevik Revolution (1917) and subsequent Russian Civil War (1917-1922), when the new regime was militarily weakened, Latvia and the other Baltic states became independent for the first time. According to the Latvian census conducted in 1935, Latvians made up 77 percent of the population. Russians were the largest minority group but constituted only 8.8 percent of the population, followed by Jews (4.9 percent), Germans (3.3 percent), Poles (2.6 percent), and Belarusians (1.4 percent). As a result of the Moltov-Ribbentrop Pact in 1940, which secretly divided Eastern Europe into Nazi and Soviet spheres of influence, Latvia came under Soviet control. From 1940 to 1941, a total of 16,563 persons from Latvia were deported to Siberia and other parts of the Soviet Union. Hitler invaded the Soviet Union in 1941, and the Nazis ruled Latvia until 1944, when it was again incorporated into the Soviet Union. During Nazi rule, nearly the entire Latvian Jewish population was exterminated, while some 65,000 to 240,000 Latvians managed to escape to the West, primarily to the United States, Canada, Australia, Germany, the UK, and Sweden. The inflow of people from other parts of the Soviet Union started in mid 1941 and peaked in the post-war period (1945 to 1959). Because of the upheavals of this period, the population of Latvia increased only 10 percent, from 1,905,000 at the time of the 1935 Latvian census to 2,093,000 in 1959 when the Soviet Union's first post-war census, which included Latvia, was conducted. During this period, the ethnic balance shifted from ethnic Latvians to Russians, whose population increased 230 percent from 168,000 to 556,000. The Latvian population decreased by 169,000 as a result of forced deportations, the voluntary outflow of Latvians to other parts of the Soviet Union, and low levels of natural increase. In addition to the thousands deported in 1940-1942, between 1945 and 1949 another 43,904 were forcibly expelled to elsewhere in the Soviet Union. Those deported during the war were thought to be Nazi sympathizers; those deported afterwards were thought to be potential opponents of Soviet rule. At least 60,000 people from Latvia in total were exiled to Siberia and other places across the Soviet Union, although some estimates place the total close to 200,000. For most of the post-war period, Russians continued to pour into Latvia, and there was a very real fear that Latvians would become a minority in their own republic. The Latvian share of the population of Latvia declined from 62 percent in 1959 to 52 percent in 1989, just prior to the breakup of the Soviet Union (see Table 1). The Russian share increased from 27 to 34 percent, and the share for all Slavic groups combined increased from 31 to 42 percent. Sources and notes: 1935, 1989-2004: Central Statistical Bureau of Latvia, Demography 2004: Collection of Statistical Data, Riga: 2004, p. 41. Data for 2004 are estimates. 1959-1979: Central Statistical Bureau of Latvia, Results of the 2000 Population and Housing Census in Latvia: Collection of Statistical Data, Riga: 2002, p. 121. Over this 30-year period, the largest factors in population growth were net immigration and the natural increase of Russians. Latvia had a positive migration balance with the rest of the Soviet Union every year until 1989 although immigration slowed from an annual average of 18,000 during the 1950s to about 8,000 during the 1980s. Despite Latvians' slightly higher fertility rate than the Russians in Latvia (2.3 versus 1.9 children per woman) and slightly higher life expectancy, because of their older age structure than Russians, they had a lower rate of natural increase. Russians in Latvia were also concentrated in urban areas because of their occupations; this characteristic of the Russian diaspora was common throughout the former Soviet Union (FSU). In 1935, Riga was 63 percent Latvian and only nine percent Russian (with Germans making up 12 percent). By 1970, Russians had become the largest ethnic group in Latvia's capital. While Russians made up 34 percent of the total population of Latvia in 1989, they constituted 41 percent of the urban population and 47 percent of Riga. In 1989, only 36 percent of the capital's population was Latvian. Russians were also disproportionately represented in the Latgale region of eastern Latvia, which borders Russia. For centuries, Latgale had stronger Slavic (both Polish and Russian) influences and had been part of the Polish commonwealth. Given this demographic reality, Latvians feared Russians were overrunning their homeland and national identity. Yet there was little day-to-day hostility between Latvians and Russians. Before Latvia gained independence from the Soviet Union in 1991, 21 percent of Russians professed to speak Latvian as a second language, while 66 percent of Latvians spoke Russian as a second language. The Latvian language as well as cultural symbols were better preserved and used more than the native language and symbols of other parts of the Soviet Union. When Latvia became part of the Soviet Union, it was a predominantly agricultural economy. But Soviet central planners quickly transformed it into an industrial economy and center for metal and machine-working and associated heavy industries, despite a lack of raw materials and energy base in the country. A shortage in local workers to staff these new industries was part of the reason for the influx of Russians and others from elsewhere in the Soviet Union. Also, Riga was made the headquarters of the Baltic military district and became home to some 50,000 World War II veterans and 60,000 to 100,000 retired Soviet officers. Later, in the 1960s and 1970s, electronics and communications industries were developed in Latvia. Because of their proximity to Western Europe, their brief independence, and other factors, Latvia and the other Baltic states were always among the most prosperous regions of the Soviet Union and had the highest standards of living. Through the Soviet Union's complex, centrally planned budget, Latvia was a net financer to the rest of the country. All of the states that emerged from the FSU faced the same dilemma in the early 1990s — whether or not to grant citizenship to ethnic Russians and other nonnatives. Most decided to grant citizenship to all residents, regardless of ethnicity. However, Latvia did not view itself as a new state but as a continuation of a Latvian state that existed between the two World Wars. Although some extremists advocated repatriating the Russian population, Latvia instead chose to exclude them from citizenship even though many had spent most, if not all, of their lives in Latvia. In 1989, 55 percent of Russians had been born in the country and 36 percent had been born in Russia. Of those Russians born outside Latvia, one-fourth had lived in the same place in Latvia for 20 years or more. Yet, immediately upon its independence, Latvia restricted citizenship to pre-1940 citizens and dependents, thus leaving out an estimated 700,000 to 800,000 people, most of whom wanted to remain. The government did not pass an actual citizenship law until 1994, however. The 1994 law stated that in order to become a Latvian citizen, a person must have lived in Latvia for five years and have command of the Latvian language and basic knowledge of Latvian history and society. This approach upset both Russia and the international community because the naturalization tests made it practically impossible for older Russians who grew up in Latvia to obtain citizenship. Latvia, sensitive to criticism, wanted to be seen as a Western-style democracy and eventually join the EU, so it softened some aspects of its citizenship law and issued noncitizen passports to allow freedom of travel in the EU and elsewhere. Noncitizen residents can travel on noncitizen passports that provide the same rights as citizen passports. To date, about 690,000 noncitizen passports have been issued. As of 2004, about 50 percent of the Russians in Latvia were Latvian citizens; most are under age 10 because of a 1998 amendment to the 1994 law that grants citizenship automatically to children born in independent Latvia. Of the remainder, 47 percent were noncitizens and three percent were citizens of foreign countries. There are still a large number of people who continue to have USSR citizenship. As of the beginning of 2004, about 21 percent of the residents of Latvia were noncitizens and the citizenship acquisition rate had slowed to less than 10,000 a year, or about two percent of noncitizens. Overall, integrating the Russian population has not been the government's highest priority. Initially, noncitizens (mostly Russians) were not able to vote, hold state office, own land and other natural resources, or purchase housing from the state; many were also denied some housing and social benefits. Because of pressure from the EU and a realization that there will continue to be a sizeable Russian minority, the Latvian government has taken steps to socially integrate Russians. These include ratifying, in 2005, the Council of Europe's Framework Convention for the Protection of National Minorities. This convention, among other provisions, gives minorities equal rights and equal protection before the law, bans discrimination based on ethnic origin, and protects the right to freely use one's native language both publicly and privately. 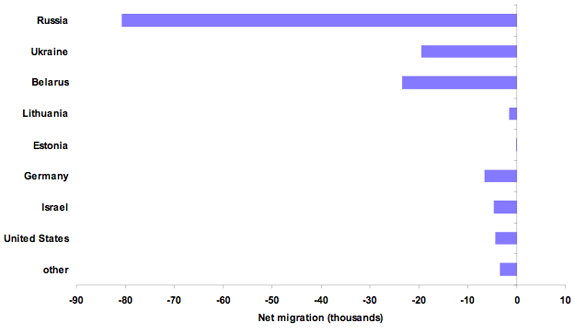 The uncertainty over Russians' status in independent Latvia is reflected in migration trends. In 1989, there was a net outflow of 3,968 persons (mostly Russians) but this grew quickly to 15,045 in 1991 and peaked in 1992 at 53,474 (see Figure 1). However, the exodus of Russians was rather short lived. 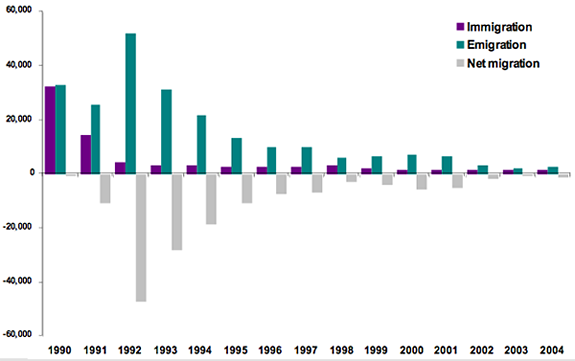 The net outflow from Latvia fell to just 10,000 by 1996, about one-fifth of the 1992 peak. By 2003, the annual net outflow of Russians from Latvia to Russia was about 700. According to data from the Russian side, about 96,000 Russians left between 1989 and 2003, which is slightly higher than the figures from the Latvian side. The outflow to Ukraine and Belarus was also high as ethnic Ukrainians and Belarusians chose to return home (see Figure 2). The drop-off in Russian emigration was partly due to the relative stability of independent Latvia's economy compared to the Russian economy. Latvia and the other Baltic states were able to shift their foreign trade away from the FSU towards Western Europe rather quickly. After shrinking by nearly 50 percent, the Latvian economy started to grow in 1994, and by 2004 was at 89 percent of its pretransition level. Meanwhile, the Russian economy did not achieve consistent growth until 1999 and stood at only 81 percent of its 1989 level by 2004. Despite being second-class citizens, life for Russians and other Russian speakers in Latvia's Western-style democracy seemed preferable. Independence also gave Latvians living in other parts of the Soviet Union the opportunity to come home. The number of Latvians residing in the FSU fell by about half, from 72,000 to 36,000, during the 1990s. However, repatriation of ethnic Latvians from outside the FSU has been rather small, amounting to only 300 to 400 persons a year, though the Latvian government is now making more effort to reach out to its diaspora population. In some cases, their influence has been significant. The current president of Latvia, Vaira Vike-Freiberga, is the daughter of World War II refugees. She spent most of her career in Canada before returning in 1998. Outside the FSU, three states — Germany, Israel, and the United States — were the top destinations of Latvian emigrants through the 1990s. Between 1990 and 2003, 6,400 people from Latvia migrated to Germany, 4,700 to Israel, and 4,200 to the United States. Some migrated because they were Jewish or ethnically German; others joined family or went for economic reasons. According to the Office of Citizenship and Migration Affairs, there are 200,000 Latvians living abroad, but accurate estimates are hard to calculate. Latvia's first census, conducted in 2000, counted 2.4 million people and confirmed that its population had been declining due to net emigration and more deaths than births. This trend is expected to continue. The emigration of Russian speakers was the major factor in population decline although the numbers of all major ethnic groups, including Latvians, decreased between 1989 and 2000. The Russian population in Latvia declined by 22 percent, the Belarusian population by 19 percent, and Ukrainians by 31 percent. The percent of Russians declined from 34.0 to 29.6 percent and further to 28.8 percent in 2004, while the Latvian population had increased to 57.7 percent in 2000 and 58.6 percent in 2004 (see Table 1). The census also showed that the Russian population of Riga had fallen from 47 to 44 percent while the Latvian population had increased from 36 to 41 percent, standing at 42 percent in 2004. If these trends continue, Latvians could become the largest ethnic group in their capital city for the first time in 50 years. These relative ethnic shares, about the same as those in the 1960s, demonstrate that most of the Russian speakers who wanted to leave Latvia already have done so and that Latvia will have a large Russian-speaking minority in the future. Of the Russian diaspora of 25.2 million persons in 1989, about 13.4 percent have returned to Russia. From Latvia, about 10.6 percent of Russians have returned. Only Belarus and Ukraine have had smaller shares of their Russian population go back to Russia. The Office of Citizenship and Migration Affairs is responsible for implementing migration policy, including development of repatriation and asylum policy, issuance of identity and travel documents, and maintenance of the national population register. Refugee issues, though, do not receive much government attention. In the past few years, fewer than five people per year have received refugee status, and, in some years, the government has not granted refugee status to anyone. The office's major task has been bringing Latvia's migration and visa policy in line with EU requirements. To this end, Latvia passed a new immigration law in July 2003 that spelled out the specifics of foreigner entry into and residence in Latvia and further adjusted the list of visa-free countries. Visa policies are being aligned with other EU Member States, and border controls are gradually being abolished as with other EU members in the Schengen area (see article on Schengen here.). Through September 2005, 19,915 Latvians had applied to work in the UK, according to data from the UK Worker Registration Scheme. Perhaps another 10,000 had sought work in Ireland and Sweden. In the UK, Latvians are disproportionately represented in agriculture with 26 percent working in that sector versus 13 percent of all registered workers. Since the bulk of the Russian-speaking population in Latvia has decided to remain, the government has pushed schools to use Latvian and move away from using Russian. This was the purpose of education and language laws passed in 1998 and 1999, which some Russians protested. Many Russian-speaking parents today are trying to raise their children bilingually by sending them to Latvian kindergartens. As a result, it seems two parallel education systems are developing, one Latvian and one Russian. Most Latvians and Russians are content with this structure. Already, Latvian-language skills have improved. The number of Russians who speak Latvian increased from 21 to 50 percent between the 1989 and 2000 censuses; Belarusians' numbers jumped (19 to 49 percent), as have those for Ukrainians (from eight percent to 47 percent). In 2003, less than half of all marriages in Latvia were between two Latvians, and 15 percent were between a Latvian and Russian. In the census and other statistical counts, individuals are allowed to declare only one nationality. Data show that about two-thirds of children of these mixed marriages choose Latvian as their nationality. Indeed, the younger generation of Russians seems to be integrating more easily because of their citizenship status and their Latvian language skills. They can continue to enjoy Russian cultural life because of the size of the Russian population. Latvia's population is projected to decline to 1.3 million by 2050 because of extremely low fertility rates and an aging population. In addition, the number of Latvians migrating to other EU Member States may well hasten this decrease if economic opportunities at home do not improve. These demographic trends have a number of implications for Latvia's economy and society, and the government may need to adjust its policies in the future to encourage Latvians to return home and to persuade foreign workers to immigrate. Anderson, Barbara A. and Brian D. Silver (1989). "Demographic Sources of the Changing Ethnic Composition of the Soviet Union", Population and Development Review, Volume 15, Number 4, pp. 609-656. Central Statistical Bureau of Latvia. Central Statistical Bureau of Latvia (2004). Demography 2004: Collection of Statistical Data, Riga. Central Statistical Bureau of Latvia (2002). Results of the 2000 Population and Housing Census in Latvia: Collection of Statistical Data, Riga. Dorodnova, Jekaterina (2003). "The Russian-Speaking Identity Under Latvian Language Policy", Diasporas and Ethnic Migrant: Germany, Israel and Post-Soviet Successor States in Comparative Perspective, edited by Rainer Munz and Rainer Ohliger, London: Frank Cass, pp. 221-237. Heleniak, Timothy (2004). "Migration of the Russian Diaspora after the Breakup of the Soviet Union", Journal of International Affairs, Columbia University, vol. 57, no. 2, pp. 99-117. Office of Citizenship and Migration Affairs, Ministry of Interior, Republic of Latvia. Timothy Heleniak is a Research Associate at the University of Maryland, International Development Consultant, and Editor of Polar Geography.